Weakness in fixed income worse than CEO Michael Corbat's recent predictions. Citigroup Inc. ( C), the third-largest U.S. bank, said profit tumbled 86 percent, missing analysts’ estimates after year-end trading slumped more than forecast. Fourth-quarter net income fell to $350 million, or 6 cents a share, from $2.46 billion, or 77 cents, a year earlier, Citigroup said today in a statement. That’s less than the 9-cent average estimate of 20 analysts surveyed by Bloomberg. Declining fixed-income business cut markets revenue 14 percent, worse than the 5 percent drop Chief Executive Officer Michael Corbat predicted a month ago. Profit slid after markets broke from a period of muted volatility that spanned much of last year and as the dollar strengthened, shrinking earnings from overseas. While dealers typically like when prices swing because it spurs trading, they prefer “sustained, reasonable levels” that follow a trend, Corbat said Dec. 9. Bank of America Corp. today reported an 11 percent profit drop as fixed-income trading fell. Revenue from fixed-income markets fell 16 percent from a year earlier to $1.99 billion, Citigroup said. JPMorgan Chase & Co. (JPM) reported a 14 percent drop in that business, excluding the sale of a commodities unit, to the lowest level since the financial crisis, on Wednesday. Trading in equities at Citigroup generated $471 million in revenue, a 2.7 percent decline from a year earlier. That compares with JPMorgan’s 25 percent jump to $1.1 billion. For the full year, Citigroup’s profit tumbled 47 percent to $7.31 billion, which “fell short of our expectations,” Corbat said in the statement. Citigroup fell 0.8 percent to $48.64 at 8:38 a.m. in New York trading, after declining 9.4 percent this year through yesterday. In the weeks after Corbat forecast a 5 percent drop in trading revenue, the Standard & Poor’s 500 Index fell to its first monthly loss since September. Crude oil prices also plunged in the quarter amid a global supply glut, dragging commodities to a fourth straight annual drop. Corbat has expanded some trading businesses while rivals retrenched in response to periods of low volatility, a shift to electronic platforms and new rules that limit bond inventories and risk-taking. The bank ended up cutting the bonus pool for traders and salespeople after their division’s lackluster performance in the final weeks of 2014, a person briefed on the matter said last week. Within fixed-income, Carey Lathrop is global head of credit, and Jeffrey Perlowitz and Mark Tsesarsky are co-heads for securitized products. Andy Morton manages interest rates and Nadir Mahmud runs the currency business. Howard Marsh is head of municipal bonds. Stu Staley oversees commodities and Derek Bandeen heads equities. All report to Paco Ybarra. Revenue excluding accounting charges for the institutional clients group — which includes trading as well as corporate and investment banking and the private bank — was little changed at $7.19 billion. The unit is run by Citigroup co-President Jamie Forese. Global consumer banking, led by co-President Manuel Medina-Mora, posted revenue of $9.44 billion that also was little changed. Companywide, total revenue excluding accounting adjustments fell less than 1 percent over the prior year to $17.8 billion, missing the $18.6 billion estimate of 18 analysts surveyed by Bloomberg. The impact of converting foreign currency to U.S. dollars reduced sales by $458 million, according to a presentation on the company’s website. Citigroup boosted the quarter’s results by taking $441 million out of reserves for loan losses. The bank now has $16 billion in reserve, or 2.5 percent of total loans outstanding. JPMorgan’s trading results and higher-than-estimated costs spurred analysts to ask CEO Jamie Dimon whether the firm could unlock shareholder value by splitting in pieces, potentially blunting the impact of stiffer capital rules for big banks. JPMorgan benefits from its size and diversity, which helped it weather the financial crisis without a quarterly loss, Dimon said. The stock fell the most in three months. As Corbat looks to meet performance targets this year, he is trying to resolve legal costs, which totaled $2.85 billion in the fourth quarter. The lender still faces probes into money- laundering controls and rigging of currencies and interest-rate benchmarks. Citigroup also set aside $655 million in the period for repositioning costs such as severance and office closures. Corbat signaled the legal and personnel expenses last month. In October, the bank adjusted the previous quarter’s earnings to add a $600 million legal charge that it attributed to fast- moving settlement talks. 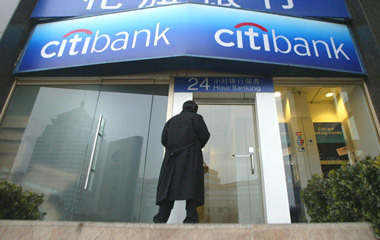 Citi Holdings, the bank’s unwanted assets tagged for sale, earned $158 million on revenue of $1.31 billion. Assets fell 5 percent from the third quarter to $98 billion on Dec. 31. The bank’s shares rose 3.8 percent last year, lagging behind the 13 percent advance in the S&P 500 Financials Index. Analysts have been looking for signs that costs will wane, allowing profits to improve. “Citigroup is our top idea for 2015 due to valuation and fourth-quarter charges that will allow investors to focus on stronger core earnings in 2015,” David Konrad, an analyst at Macquarie Group Ltd., wrote in a Jan. 5 report. –With assistance from Jing Cao in New York.